Here's another gift idea to use your gift tags on. It's a little box, filled with...gift tags! 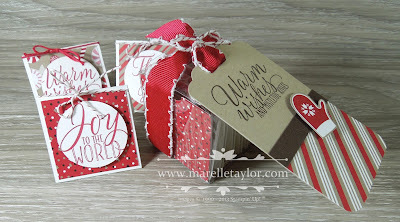 We all have lots of presents to wrap at this time of year, so I think gift tags make a great gift for anyone. Mine are very simple, and sized to fit inside the clear Tiny Treat boxes. You can squeeze a dozen of these in the box if they aren't too layered and bulky.